No April Fools joke today. Just the top five accessories for your pool cue. 5. Joint Protector – It’s always a good idea to protect the joints on your cue. You don’t want chalk or other residue to get on the threads, making it difficult to screw it together . Joint protectors are fairly inexpensive and a great way to extend the life of your cue. 4. Q-Wiz – The best tool to clean your cue shaft. The Q-Wiz is a double sided micro pro disc. One side is used for cleaning while the other is used for polishing. 3. Tip Tool – The tip is the most important part of your cue. So you want to make sure that you tip is always shaped and scuffed to perfection with a tip tool. Whether it’s a shaper/scuffer cube or a 3-in-1 tool that includes a tip-pik, a tip tool is integral for any billiards player success. 2. Chalk – A cue can’t function without chalk. You need it if you want to put any kind of english on the ball. Low-end chalk is cheap and what you’ll likely find in poll halls. It doesn’t hold well, meaning you’ll likely have to re-chalk after every shot. An inexpensive chalk upgrade would be the Predator chalk, which holds longer. Or you can really upgrade and go with kamui chalk, where one dab will last you an entire game. 1. Case – Your pool cue isn’t complete without a cue case. Anything worth having is worth protecting, so making sure you have a good case that’s going to hold and protect your cue is the most important thing you can do. The last think you want to do is leave your cue out on the bar or in the car or carrying around two pieces of wood that could be damaged if you drop either one. You buy a case for your phone, right? Than you need to buy a case for your cue. 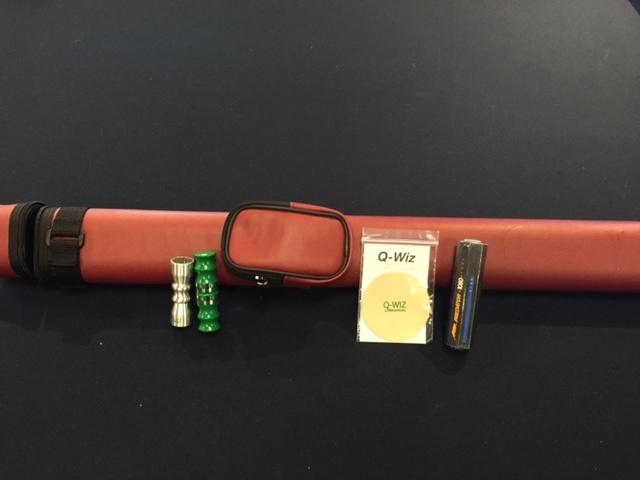 If you have any questions about cues or any of these accessories feel free to call our store at 919-783-7447.